From the Academic Directorate of Neurosciences (C.A.A.H., R.O'.M., M.K.R., S.P., Z.P., S.B., C.J.M., P.J.S., M.H. ), Sheffield Teaching Hospitals NHS Foundation Trust, Royal Hallamshire Hospital; Sheffield Institute for Translational Neuroscience (SITraN) (C.A.A.H., R.S., T.R., C.J.M., P.J.S., M.H. ), University of Sheffield; Sheffield Diagnostic Genetics Service (N.J.B., J.M. ), Sheffield Children's NHS Foundation Trust; Department of Clinical Neurophysiology (G.R., P.S. ), Sheffield Teaching Hospitals NHS Foundation Trust, Royal Hallamshire Hospital; Academic Unit of Radiology (N.H.), University of Sheffield, Royal Hallamshire Hospital; and Sheffield NIHR Biomedical Research Centre for Translational Neuroscience (C.A.A.H., N.H., R.S., P.S., S.B., C.J.M., P.J.S., M.H. ), United Kingdom. Mutations described in our cohort of patients are annotated above the SPG7 protein structure, while previously published mutations are below. Allelic frequency is noted within parenthesis. New mutations detected in our cohort are highlighted in red font. Variations denoted in blue are matching complementary DNA sequence of the reported mutations. Some large exon deletions reported are indicated in the text box. Parentheses from mutations removed to create space. AAA = ATPases associated with diverse cellular activities; Coil1 and Coil2 = coiled domain; FtsH = filamentation temperature-sensitive mutant in Escherichia coli domain; TM1 and TM2 = transmembrane domain 1 and 2. Reference sequence: NM_003119.3. 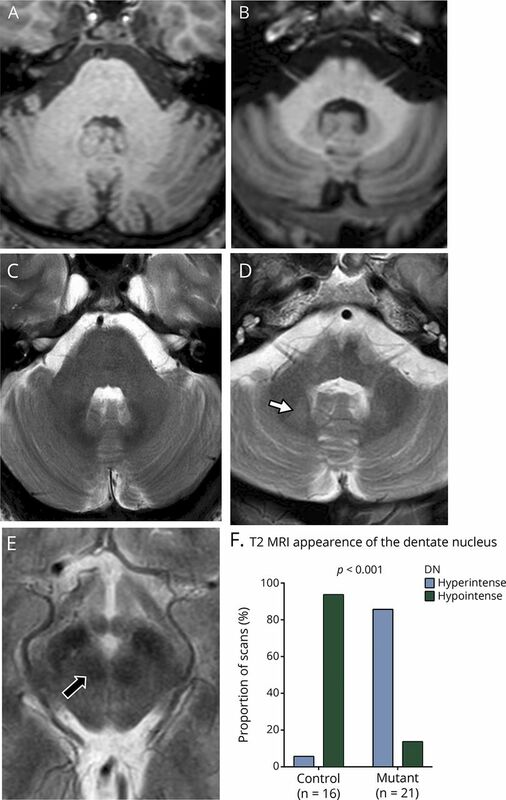 (A) T1 axial image across the dentate nucleus (DN) of a control case. (B) T1 axial section through the DN in a patient with c.1529C>T homozygous mutation. (C) T2-weighted axial image of the same control and (D) T2 axial section through DN in the same patient with c.1529C>T homozygous mutation, which demonstrates hyperintense DN (solid white arrow) compared to the normal-appearing white matter. (E) T2-weighted axial image of the same patient, which demonstrates the red nucleus (RN). The RN appears hypointense compared to normal-appearing white matter in all SPG7 and control cases (solid black arrow with white border). (F) The observation of hyperintense T2 signal of the DN was significantly more frequent in the SPG7 patients compared to the control cases (p < 0.001, χ2 test value 25.7649). (A) Association of the position (by the functionally important regions) of the mutation and the age at onset in homozygous SPG7 cases. N terminal = up to first 140aa; FstH = 141-250aa; AAA ATpase = 306-481aa; M41 peptidase = 544-746aa; the rest = mutations in any other area(s), which is/are not described as above. We selected homozygous cases because of the uniformity they create by harboring 2 similarly, mutated alleles, to compare the effect of the mutation within functionally important domains of the SPG7 protein on the age at onset. One-way analysis of variance with multiple comparisons and post hoc Tukey test showed a significantly (p = 0.034) younger age at onset (14.63 years, SE 5.25, 95% confidence interval: 0.82–28.4) for those with homozygous mutations in the M41 peptidase domain compared to a mutational position in a functionally undefined domain (“the rest”). (B) The c.1529C>T common mutation when in the homozygous state is associated with a significantly later age at onset than when in the compound heterozygous state. (C)1529C>T patients provide a degree of mutational homogeneity, in that at least 1 allele is constant allowing comparison between homozygous and compound heterozygous states. Compound heterozygotes developed symptoms on average 5.4 years earlier than the c.1529C>T homozygotes (p = 0.022, independent samples t test for equality of mean values with equal variances assumed).